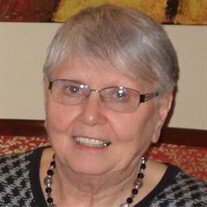 Darlene A. Bischoff, age 82, of New Prague, MN, passed away Sunday, July 8, 2018, at Brookdale Senior Living of Eagan. Celebration Services of Darlene's life will be held on Wednesday, July 18, 2018, at 10:30 a.m. at the Parker Kohl Funeral Home, 1725 Lyndale Ave. N., Faribault, MN, with the Rev. Henry Doyle, officiating. Interment will be at the Fort Snelling National Cemetery in Minneapolis. Visitation will be held on Wednesday from 9:30 - 10:30 a.m. at the funeral home. Darlene Ann was born on April 18, 1936 in Pelican Rapids, MN to Martin and Alma (Aarness) Haugen. She graduated from Pelican Rapids High School with the class of 1954 and attended secretarial college. Darlene was united in marriage to Dale Bischoff on June 22, 1956 in Pelican Rapids. She worked for 26 years at Abdallah Candies in Burnsville, MN. Darlene enjoyed collecting antique glass items, reading, gardening, and knitting blankets, throws, and dish clothes. She and Dale loved camping, and for close to 20 years traveled much of the country. She is survived by her husband, Dale Bischoff of New Prague, MN; daughters, Debbie (Dave) Burton of Sioux Falls, SD, DeAnn (Don) Rasmussen of Faribault, Darla (Loren) Heggemeyer of New Prague, David (Andrea) Bischoff of Maple Lake, MN; six grandchildren; two great grandchildren; brother, Duane (Helen) Haugen of Fergus Falls, MN; sister, Janet (Orlando) Follingstad of Ottertail, MN; and many other relatives and friends. She was preceded in death by her parents, Martin and Alma; brothers, Glanis Haugan, Jerome Haugen, and Manley Haugen; and sister, Delores Sorum.